In September I started my PGCE course with the view of qualifying to become a primary school teacher. In fact, it was one of our 'P.E.' training days which inspired this piece. During a workshop on the subject a great deal of the learning was done with footballs and volleyballs in order to generate an idea of what could be done which each apparatus - throwing, catching and of course kicking. Within a few minutes a fair number of the students, myself included, were doing keep-ups, passing and shooting into an imaginary goal, leaving one coursemate a little baffled - she asked me, "why do people love football so much!?" - which got me thinking...why indeed? Over the last three years since we set up The Football History Boys - Gareth and I seemed to have each focused on specific eras of the game's illustrious past, with the Victorian era being one of certain intrigue. So this is where we begin, with the games origins - did people love it from the start? The simple answer would be yes - but why? Sport owes much of its beginnings to Victorian Britain with the codification of numerous 'modern' day games like tennis, rugby and of course football. The Victorian thirst for active competition and social recognition helped to fuel this hysteria around physical exercise. 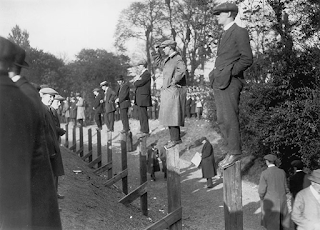 It would seem that the sport's simplicity was another reason for its rise in popularity - a game of football can be created in the back-garden; the park or anywhere two jumpers can be placed to represent goalposts. 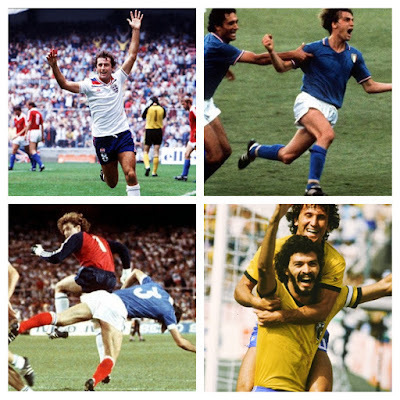 Football was active, engaging and represented more than just personal pride. The element of teamwork and identity helped bring the game to new levels of commitment and livelihood. People now had something tangible and representative of their cities, towns and villages - an opportunity to promote their pride to the wider nation. Eric Hobsbawm's words highlight the power football truly has over an entire nation. Is this why we truly love football? Indeed, when finding yourself at an international football match it is common to see a plethora of symbols which highlight national pride - flags, anthems, songs and even war metaphors are all used to bring together a collection of people. For myself, I have never felt as proud to be 'Welsh' as when Chris Coleman's side qualified for the European Championships in June. It is not a feeling uncommon with the rest of the nation - indeed social media would provide a wealth of tweets containing words like 'proud to be Welsh' or 'Cymru am Byth'. "In every county, in almost every town and village throughout the British Isles, the game of football has gained a marvellous hold upon the public. Its popularity is universal. A great match will draw thousands of people, many of whom are eager to pay fabulous prices if they can only obtain a good view of the progress of the game. So great has been its development that it may truly be said to have won pre-eminence as the national game. Wherever it is played those who excel and are famous for their ability in it have attained a hold upon the admiration and affection of their fellows, such as is to be envied by persons who have a taste for a quiet life." 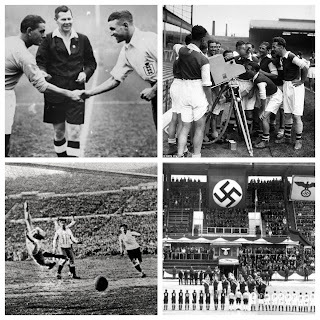 At The Football History Boys we have written fairly extensively about the role football played in the First and Second World Wars. In a time of disillusionment and a collective uncertainty - the game provided a basis for togetherness and reality. The Football League was not even suspended until 1915, a year after conflict had begun, why? The reason was simple, football was seen as something people could rely on, when all else was failing. Eventually, footballers would succumb to the call of war - playing key roles in the theatre of conflict. Nevertheless, even in the most unlikely of places, one thing brought the two sides together on Christmas Day, 1914 - a football match. 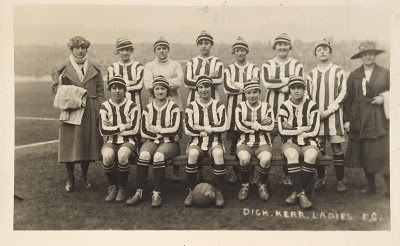 Even after 1915 football carried on, this time with the introduction of the women's game. Munitionettes raised money for the war-effort as well as morale. 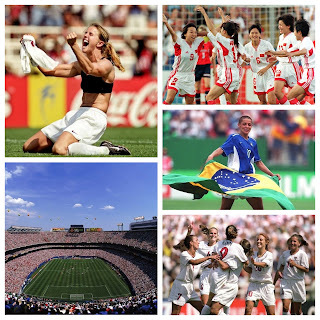 This introduction of the women's game should not be understated - the sheer fact that women were playing football once more offers ideas of freedom and expression. Women could be liberated on the pitch. Of course there was some discourse from the wider misogynistic society - but around the same time, suffrage was granted to females for the first time in the United Kingdom. Sport had played a vital role in achieving this. Despite a later ban on the women's game - it has become stronger than ever in the last 10 years, with the heroics of the Lionesses in Canada proving that football is more than just a 'man's game'. Perhaps football's heyday was in 1923 - the White Horse Cup Final. The fixture between Bolton and West Ham attracted up to 300,000 spectators before kick-off. It is rare that these kind of numbers are ever replicated in any other walk of life. The FA Cup Final by 1923 created a holiday atmosphere - often seeing northern spectators make the pilgrimage to London, to see their team represent them under the watch of the rest of the nation. It was not just in Britain that a collective enthusiasm for football was found. Following the Second World War, the West German victory in the 1954 World Cup once more showed the power that football has. Indeed, during the War, football was played through 'wartime friendlies' with league players representing various clubs as well as their RAF, Army and Navy teams. 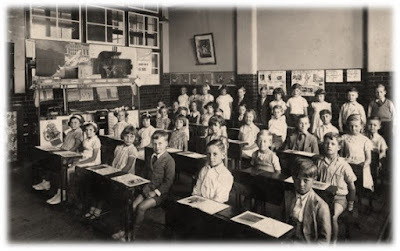 In 1954 however, in what has now become known as the 'Miracle of Bern', the sports draw reached new levels. Already achieving somewhat of a revolution due to the reinvention of the game by Ferenc Puskas' Magical Magyars, the Hungarian defeat to West Germany paved the way for a change in Germany's international relations as well as a wave of genuine euphoria throughout the nation - not seen for decades. "It was a kind of liberation for the Germans from all the things that weighed down upon them after the Second World War...July 4, 1954 is in certain aspects the founding day of the German Republic...In one 90-minute match against Hungary, modern-day Germany was born." 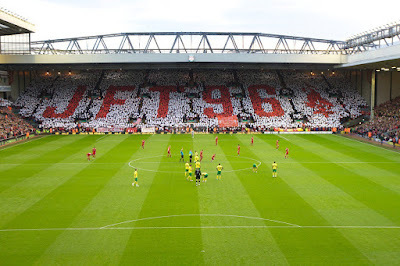 Football isn't without its tragedy however, the Munich Air Disaster in 1958 and the Hillsborough Disaster in 1989 has shown that the sport is not immune to devastation. However, it has truly brought out the best (and worst) in people. The general sense of community and collective remembrance has shown that football is something which we can pride ourselves in. The police incompetence in 1989, so disgustingly covered-up for 25 years highlights another side to public perception towards the game. The lies printed in The Sun following the deaths of 96 fans brought the city of Liverpool together as the fight for justice began. To this day the united community and the wider support from all areas of the nation once more showed the power football can have, even in the face of persecution. In the modern day football is never short of tales concerning economics, sociability and even politics. Just last week Greek players staged a sit-down protest, due to the poor treatment of migrants in the nation. Football's global charm provides the perfect platform to demonstrate an idea to the world. Indeed the World Cup has seen the togetherness of almost every nation on Earth - even in the 2010 World Cup, North Korea qualified and almost drew with Brazil. Football had brought a nation regarded as the most secretive on Earth out of the shadows and on the televisions of more than a billion people worldwide. 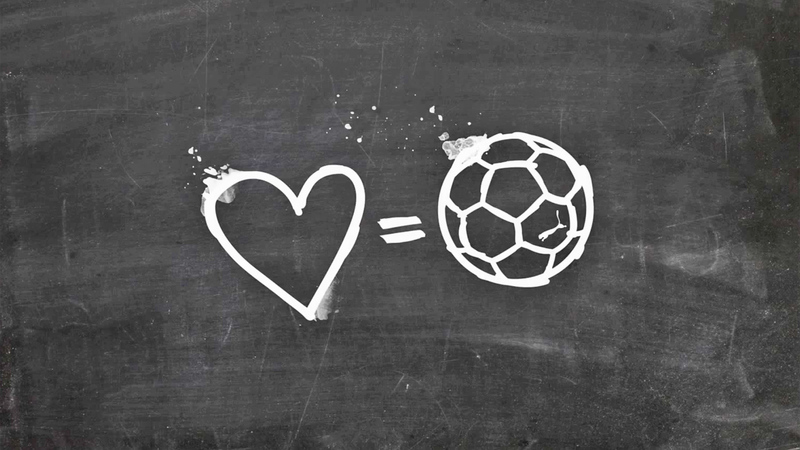 So why do we love football? For me, it is from within its power to bring people from all walks of life together as a collective, even if it is just for 90 minutes. Football has affected all of our lives in some way, directly or indirectly. The game's simplicity and adaptability to any location or climate means it can become a source of freedom and expression in societies which often demonstrate anything but. Throughout the last 150 years, we have seen change on an unprecedented scale through technology, society and politics - but football, as a game, has remained relatively unscathed despite economic introduction - it is still 11-a-side, still 90 minutes and still the game of the people.